The dynamically paired duo of A Winged Victory For The Sullen (Dustin O’Halloran and Adam Wiltzie) met backstage at a Sparklehorse show in Bologna, Italy, in May 2007, in which Wiltzie was touring. With a joint respect and love for reactive music and ambient-toned material, they went on to record their own sounds together. Although they brought out their first record in 2011, the duo could still be considered as ‘new’ and are definitely ones to watch. If you need a further idea of their genre, think musicians such as: Hans Zimmer, Nils Frahm and Ólafur Arnalds. The drones, ambiance and electronic work show hints of Stars of the Lid, Luke Abbott, Students Of Decay and Falls. Pianist Dustin O’Halloran shapes the life and decay of the music, designing repeated intricate emotion into the sounds, while Wiltzie (ambient architect from Stars Of The Lid) brings together an atmospheric landscape of transforming textures. With this shared understanding their coming together is a combination of electronic drones, looping swirls, reappearing classical piano and bright strings. In the years since they began as A Winged Victory For The Sullen, the duo has made bold and cinematic recordings that result in adventurous storytelling. You're left with no excuse but to celebrate such a daring joint effort. The music is both wondrous to behold and fascinating to witness in its evolution. At Saturday night’s gig, I found myself astounded initially by the acoustics of the room. It was a larger space than I had anticipated. The seating arrangement was staggered backwards, going higher and higher. I sat fairly central in the lower circle. Phones were switched off, lights dimmed, and the surroundings faded even more so. Emotional shapes of peril, triumph and pain cast themselves through the reverberating sounds that began emanating from the stage. ‘A Symphony Pathetique’ (from their self-titled 2011 EP) began - the softest of touches were produced on the piano, played over an infinite drone of organ sounds that rippled across the horizon. These faint notes fell into part-chords, and then particularly higher notes; it was a wonderful moment already. As the song progressed, we were united with broken radio frequency noises. This grouped interference lasted a few seconds as the drones were in the background. I have never heard scattered communication used in such a way over contemporary classical sounds and it worked perfectly. The use of phone signals consequently had many of the audience in front looking around in all directions. I, too, was confused. Was this an outside hack? Or maybe a disturbance from another show in a neighbouring theatre hall? The surround sound almost suddenly caused the noise to disappear as the warm temperature of a drone then commenced. The instruments throughout were fantastic but I should really mention the lighting at this point. It astounded me; vertical lights in the shape of poles, with dotted bulbs going along them, looked like blinking runway lights, flashing orange and yellow as they flickered to the many components of the music. Floodlights above acted as splinters, beaming along the pit of the audience like thin shards of fine light. 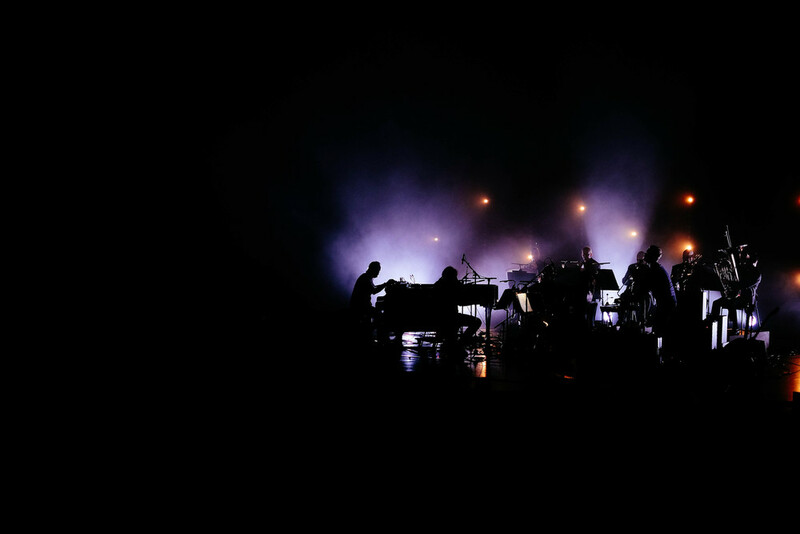 Warm desaturated tones layered across blue and white floor lamps during many quieter moments of the performance, and synchronised to the horns, piano, drones and string quartet. ‘Steep Hills of Vicodin Tears’ was one of the lighter pieces, although still with moments of dark bass. This song felt romantic and undeniably true. I was fixated to the stage, even to the ending moment of silence. The crowd deservedly stood up in applause, clapping and whistling. This was an absolutely magical experience. You can't explain the imagination of music; the innovation, skill and craft that refines us to seek healing in such creativity. However, what A Winged Victory Of The Sullen promises is to capture you the whole way through. I admired the group on stage and the harmonies produced. During many moments the cello spoke eerie words, bellowing along with the horns and drones, further sustaining its outstretched notes above this transcended piece. I left hoping this was recorded for a potential live album.